Kathleen Savio and Drew Peterson were gearing up for their divorce in 2003 when she received an anonymous letter informing her that Drew was having an affair, and to be careful and protect herself. The affair was with his soon to be fourth wife, Stacy Cales, who was 17 at the time. This letter was sent as a warning to Kathleen, to let her know she had no one to turn to for help in the law enforcement community. They were all either going to be on Drew’s side, or stay quiet to avoid confrontation, which is exactly what happened every time she called the police during and after her physically abusive marriage. So, when Drew “happened” upon Kathleen’s dead body in 2004, it was no surprise that it was somehow ruled as an accidental drowning (in an empty bathtub). 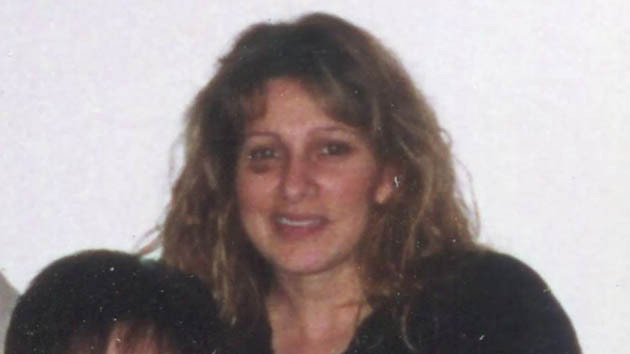 When Stacy went missing 3 years later, there was no evidence of foul play (although highly suspected), and nothing authorities could do. However, it did give authorities the extra push they needed to re-open Kathleen’s case, and now Drew Peterson is currently serving 38 years for her murder. The full letter is transcribed below. This letter is being sent to you for your benefit. At this point and time you are probably aware that you husband is having an affair. The girl’s name (and she is just that, a girl) is Stacy Yelton, born July 17, 1984, resides at 511 Preston Apt# 129 Bolingbrook, Il. You may already have all of this information, but if not, you will need it to prevent any further embarrassment and disgrace to you and your family. This affair has been going on for several months and several people have been aware of this situation. Because of her age (17) and the fact that she is an employee of the village, and because of Drew’s age and his occupation, he holds a position of authority over her. Drew could be charged criminally for his intimate involvement with this minor. Village officials (Mayor, trustee’s) and everyone at the police department have complete knowledge of this situation. It has been an ongoing joke within the department. The issue has been discussed and has been decided to conceal his behavior to protect the Village and Drew. Because of his Political alliances with Roger Claar and Ken Each they are protecting themselves from the embarrassment and the liability. The real victims, (being you and your family) should be the ones being protected from the embarrassment. This is not the first time in the past year that Drew’s immoral and unethical behavior has been concealed. This past summer Drew allowed the beating of an arrestee, who was handcuffed and defenseless. The past fall Drew was suspected to have planted narcotics (cocaine) on two separate drug raids to obtain a substantial arrest to overshadow his recent behavior, and now his illegal intimate relationship with a minor. Drew has been willing to sacrifice his integrity for his personal gain, with total disregard that his actions will embarrass and disrespect his wife and children. BEWARE whom you talk to within the Village administration and within the police department (i.e. : Mayor, Chief, Deputy Chief, etc…). 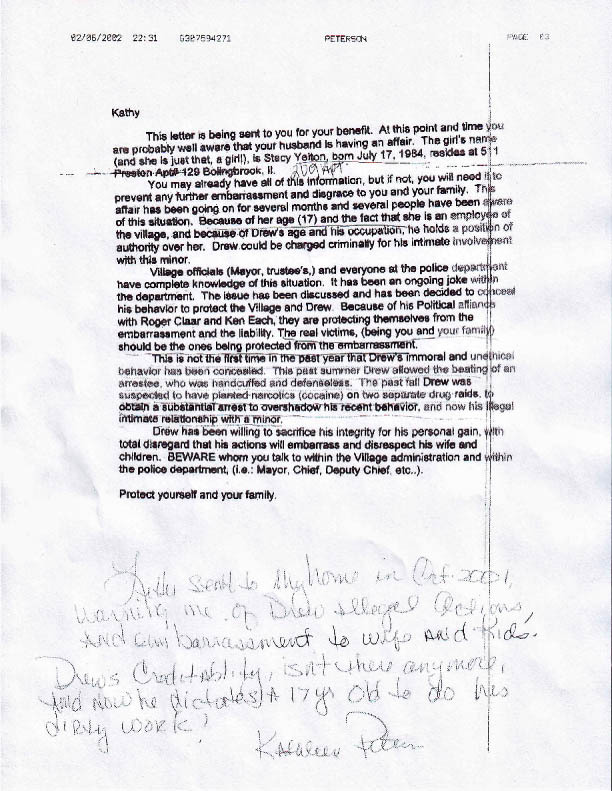 Letter sent to my home in Oct. 2001, warning me of Drew illegal actions, and embarrassment to wife and kids. Drews creditablity isn’t there anymore and now he dictates a 17yr old to do his dirty work!